It’s for those readers that the DRIFT team has compiled our first ever 30-page Powder Report that includes our recommendations for seven exceptional ski regions, including mountain conditions and location amenities, on and off the slopes. Did your favorite ski town make our list? 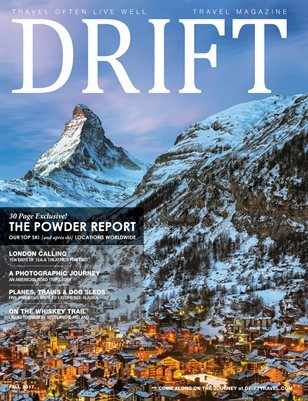 In addition to seven worldly winter destinations, this issue of DRIFT travel magazine takes you around the globe to share travel experiences in London, Napa Valley, Bogotá, Tromsø, New York, and Provence. Plus, make sure you check out this issue’s A Photographic Journey, with inspiring American Road Trip photography by Laina McWhorter.